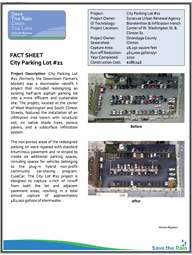 City Parking Lot #21 (formerly the Downtown Farmer’s Market) was a stormwater retrofit project that included redesigning an existing half-acre asphalt parking lot into a more efficient and sustainable site. 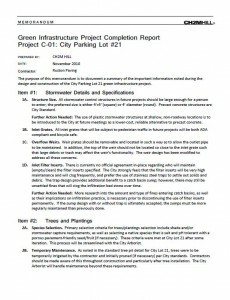 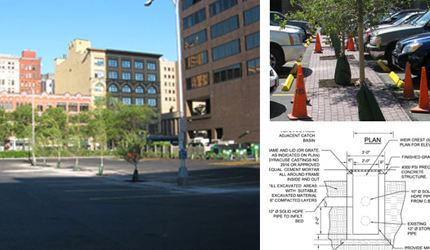 The project, located at the corner of West Washington and South Clinton Streets, featured the installation of an infiltration tree trench with structural soil, six native shade trees, porous pavers, and a subsurface infiltration system. 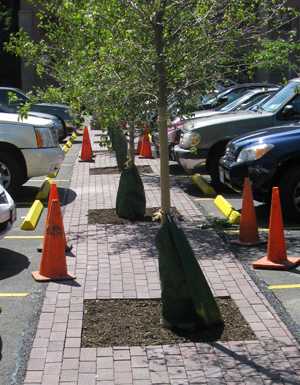 The non-porous areas of the redesigned parking lot were repaved with standard bituminous pavement and re-striped to create six additional parking spaces, including spaces for vehicles belonging to the plug-in hybrid non-profit community car-sharing program: CuseCar. 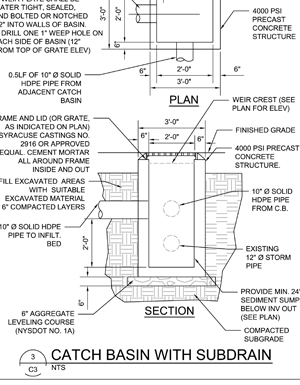 The City Lot #21 project is designed to capture 1-inch of runoff from both the lot and adjacent pavement areas, resulting in a total annual capture of approximately 462,000 gallons of stormwater.